Below we present an extract of the instructions Heaven has given us so that in the coming instants and in the face of unknown diseases, we may count on specific medicinal plants to deal with what even science will not be able to stop. In all of the messages Heaven tells us that we are not alone, and in order for us to understand the infinite reach of these words, we receive a list of natural medicines which will be our aid alongside Faith, Prayer, the Sacramental, and Holy Water. The Love of Christ and of our Most Holy Mother is infinite, so much so that in the messages and without distinctions they warn us and they give us the way to deal with the coming unknown diseases keeping in mind that Faith is the driving force of the Miracle. Boosts the immune system. Infusion: Use the leaves and dry extract from the roots. Five (5) cups on the first day. Reduce the number of cups as the symptoms diminish. 20 drops daily for 2 months, then rest for 2 months. Children under 12 years old: It may cause allergic reactions. It is not recommended if the person suffers from autoimmune liver diseases. Consult a medical doctor if pregnant or breast feeding. It may interact with other substances and medications: reduces the ability of the organism to decompose caffeine and hinder the synthesis of medications that are eliminated through the liver. It is recommended to start taking it right now; however the rest periods must be respected as per given instructions. Increases the levels of hemoglobin after a snake bite. 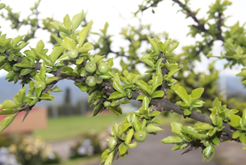 The green fruit has been used for diarrhea and mucous leucorrhea. Heart failure: Alterations of the cardiac rhythm, tachycardia, arrhythmia. To treat symptoms of nervousness and anxiety. Administer after meals. Heart failure: 160-900 mg daily, divided in 2-3 doses. Soak a handful of leaves in hot water for 8 minutes. Administer orally day and night until symptoms diminish. None is known. Nevertheless it is not recommended to use in conjunction with other medicines for heart or circulatory problems or with benzodiazepines (medication that acts on the central nervous system and to treat insomnia) if not under medical supervision by a specialist. Scientific name: Ginkgo biloba L.
Improves blood circulation: Legs, feet, coronary arteries, head, eyes (vision) genitalia, brain capillaries Regulates hypertension, asthma, depression, vertigo, and atherosclerosis. Protects the brain from senile dementia, stroke and neurodegenerative diseases. Better social behavior. To improve blood circulation: Take three (3) times per day for a total of 120 mg of extract per day. Brain diseases: From 60 to 240 mg per day divided to take three times per day throughout the day. Asthma and allergies: A total of 120 mg of extract per day divided to take 3 times each day. If it is taken in doses greater than recommended, it can cause drowsiness, nervousness, vomit, or diarrhea. During the first two days of treatment, it can cause headaches. Do not use on children under 2 years of age. Consult a medical doctor in case of pregnancy or breast feeding. The administration of ginkgo in conjunction with blood thinners like aspirin, or warfarin or heparin could cause hemorrhage Do not take for days before surgery and for 2 months afterward. Consume only when prepared under strict sanitary control. Homemade preparations of the leaves may be toxic and may produce allergies. Scientific name: Urtica dioica L.
It is known as an antioxidant, diuretic, anti-inflammatory, antiviral, analgesic, antimicrobial, liver protector. It is also used in cases of eczema, anemia, nosebleeds and menstrual hemorrhage, nephritis, hematuria, diarrhea, asthma, Alzheimer’s disease, diabetes, kidney stones. Favors digestion and blood circulation. Digestion, constipation: Infusion 2 table spoons dry leaves for each liter of water. Take three times per day before every meal. Diarrhea, tuberculosis, asthma, and as a diuretic: decoction of the dry roots for 10 minutes. Take three cups per day. For blood circulation and hemorrhage: Crush the plant, sift the pulp to obtain the juice. Take. ½ cup per day: ¼ cup in the morning and ¼ cup in the evening. Jaundice: Decoction of 5 tablespoons of the dry plant per liter of water. Take a couple of cups per day. 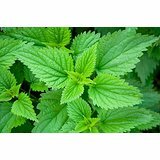 Diabetes: Boil a handful of nettles in water and take 3 cups per day. 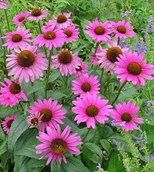 Anemia: infusion of 1 tablespoon of the dry plant three times per day. At least 3 cups of juice of nettle should be taken per week, even better if you take a cup per day. It can also be used as compresses with the decoction of the plant or cataplasms applied directly to ulcers, skin rashes, and swelling. Skin lesions when the plant comes in contact with the skin. Diabetics may have their blood sugar levels affected if taken in large doses; be alert to avoid hypoglycemia. It may affect blood pressure and it may interfere with medication used to control hypertension. It’s contraindicated in case of renal failure, nephritis, and inflammation of the kidneys or during pregnancy. 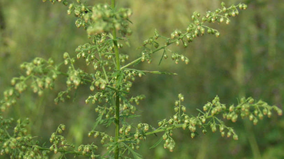 Scientific name: Artemisia annua L.
To kill the malaria parasite (Plasmodium), to improve cases of psoriasis and leukemia. C, HIV, and hypertension. It acts as an anti-inflammatory, anti-oxidant and immunosuppressive. Infusion: 4 infusions per day for a week or one per day as preventive medicine. Add 5 to 10 gr of the dry plant to 500 ml of boiling water. Let stand for 10 minutes before straining. Malaria: The tea must be taken during 7 days or even 12 days. All precautions should be taken to avoid a new infection. Not to be taken by pregnant women or those who are breast feeding. Not to be taken by people using anticoagulants like warfarin. Its use may cause vomit, diarrhea, abdominal pain, hives, nausea, bradycardia or hypoglycemia. Contact with the plant may cause allergic reactions. Do not use for a long time, it accumulates in nerves. The average life is short: 1½ hours. Interactions: With grapefruit juice and with medicines that are metabolized by cytochromes (some liver proteins). –Light of Mary asks our Mother what must we do to make the organism more resistant against the plagues that are coming. (*) It is recommended to drink 2 liters of water daily. Christ indicates that we must look for a priest and ask him to bless a bunch of grapes (or only one grape because one blessed grape can be used to bless other grapes and can feed two people if they have Faith and are properly prepared.) This will be useful for times of food shortage. Cut each remaining grape away from the bunch with scissors so each one will have a piece of stem attached to it. Then store the blessed grapes in sterilized containers. Fill ¾ of each container with grapes and then add wine or brandy (no other liquor) until each container is full. Close the containers properly. The blessed grapes will keep for as long as necessary until the time when they will be consumed. These blessed grapes may be shared with brothers for them to bless grapes of their own. Fifteen years ago Christ asked us to bless some grapes and today the grapes are still in good condition. If in some country grapes are not available, any other abundant fruit may be substituted if it is small like a grape. Virgin Mary indicates how to transfer the blessing of the grapes from one Blessed Grape to a new bunch of grapes so that more people may benefit from them. When the grapes are still attached to the bunch, wash them thoroughly in a solution of water with one or two drops of liquid soap and then rinse them. Then each grape is cut away from the bunch with scissors leaving a piece of stem on each one. Then take one Blessed Grape and rub it against one new grape making the Sign of the Cross on it while saying, “In the Name of the Father and the Son and the Holy Spirit, amen.” Beforehand, prepare a clean glass container with a lid that seals well. Certain prophecies have seen the light which state that the soldiers who go fight under the flag of Jesus and Mary and against the forces of the antichrist will be guided by Saint Michael Archangel. These men will be full of strength and will not require nourishment. This will amaze other people who will join the soldiers thus increasing the small Marian forces until it turns into a gigantic army. These people will fight until they topple the forces of the antichrist. The Most Holy Virgin has told many saints and seers that these troops will be nourished from Heaven. Maybe the Blessed Grapes are one of many Miracles of the end times seen by saints of years past in their visions. Heaven will not abandon the Faithful children. This is why Heaven has given recommendations to deal with the contamination of foods, especially for those who live in places where the vast majority of the food is contaminated.